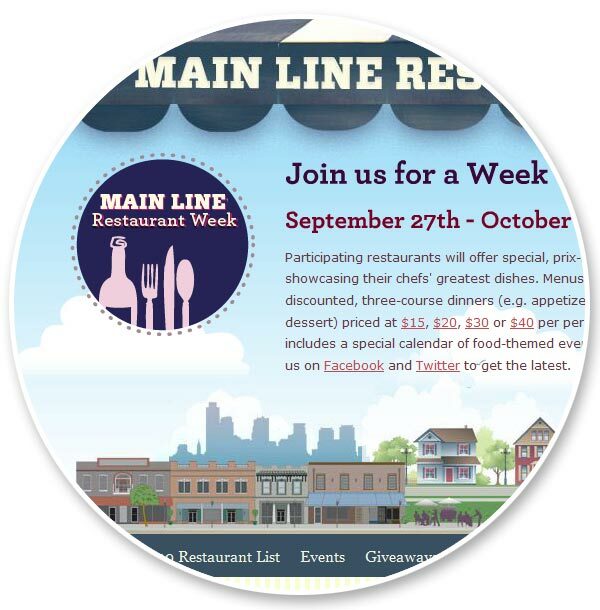 Main Line Restaurant Week is a twice annual dining event first organized by AroundMainLine.com in 2010. Participating restaurants across Philadelphia’s western suburbs offer discounted lunch and dinner menus, as well as contests, giveaways and more. “A unique design for a unique event,” was our mandate from the organizers of Main Line Restaurant Week. We started with a teaser website to stir up interest in the months leading up to the first event. This transitioned seamlessly to the live site once the initial participants had been finalized. Every year we provide continued marketing support including consulting, email invitations & announcements, traffic reporting and analysis, banner ad design and website maintenance. The Main Line Restaurant Week website was covered in over two dozen design blogs and galleries include a special mention on the popular MoLuv.com. —Sarah Lockard, Main Line Restaurant Week.